What will I feel during a root canal? We will insure you are profoundly numb prior to any treatment. If at anytime you experience discomfort let us know so we can make things right. We have comfortable seating and offer dark glasses, mouth prop and soothing headphone music to help you pass the time. For many people with young children and demanding jobs this visit to our office becomes a "time out" where they can retreat from being on call and in demand. Some even doze off! 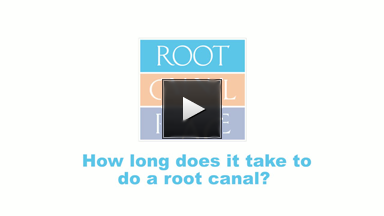 How long does it take to do a root canal? Teeth that are infected or have curvy roots are likely to require more than one appointment but, with our clinical experience and our dedication to your appointment time we are able to complete the vast majority of root canals in less than 2 hours. When you are here you have my undivided attention and it is rare for me to leave your side once treatment begins. This allows us to get your treatment completed without interruption and take full advantage of your scheduled time. I have receieved varying quotes for a root canal. Why? For most products and services a lower price reflects lower quality and a higher price does not necessarily guarantee higher performance or reliability. Our clinical success rate is at or above the industry standard and we stand behind our work with 6-12 month follow ups at no additional charge. Call our office if you would like more information on our level of service and current fees! The cost of a root canal depends on the tooth that needs treatment. If you already know which tooth needs a root canal call our office for our current fee. Many times a consultation is needed to determine whether a tooth requires a root canal. Our consultation fee includes x-rays and routine testing. Call our office and our staff will answer your questions and work with you to best serve your needs. We accept and file most dental insurances. We also offer a 10% self pay discount* for payment in full at time of treatment. There is also an option to pay over 12 months through Care Credit. Call our office to verify your insurance plan and to discuss available payment options. A root canal can be a big expense and we want you to feel confident working through any financial concerns with our experienced staff! What should I expect to feel after treatment and who do I call after hours if I need help? Is there a way to give a painless injection? We have been using the Compudent (Wand) system the past 12 years with great success. The Wand allows me to administer anesthetic as slowly as one drop at a time which greatly increases patient comfort and reduces the possibility of side effects such as racing heart and anxiety which can be related to a fast injection. Our experience of over 10,000 root canals, prompt flexible scheduling single visit treatment in most cases, state of the art facility, convenient office location, gentle profound anesthesia, courteous, experienced staff, after hours access to the doctor following treatment, acceptance of insurance assignment and reduced fees for full payment at time of treatment. Everyone in our office is committed to serving you according to our practice mission statement.